The Dallas Cowboys were off to a solid 8-1 start as they met the Buffalo Bills on November 15, 1976, but they had also been having trouble scoring in recent contests. Head Coach Tom Landry’s team, perennially a contender and coming off of a NFC Championship season, was nevertheless as formidable on both sides of the ball as the record would suggest. QB Roger Staubach was of the highest caliber and had highly-productive WR Drew Pearson (pictured at right) as his favorite target. There were injury problems among the running backs, but enough depth to keep the ground attack going, while the defense continued to be solid. Buffalo was stumbling along at 2-7 and had yet to win under Head Coach Jim Ringo, the all-time great center who was elevated from offensive line coach after Lou Saban resigned five games into the season. 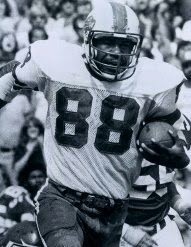 HB O.J. Simpson remained the key to the offense and was still a formidable runner, but QB Joe Ferguson and FB Jim Braxton were both sidelined by injuries and QB Gary Marangi and FB Jeff Kinney were not as able. While the game was a sellout, only 51,779 fans showed up for the nationally-televised contest (that was not blacked out locally) on a cold Monday night at Texas Stadium. The Cowboys were focused on containing O.J. Simpson, but the Bills took the opening kickoff and drove effectively as Gary Marangi completed passes of 14 and 9 yards to WR Bob Chandler and 10 yards to Simpson, who also contributed short runs along the way. But the advance stopped at the Dallas 26 and George Jakowenko missed to the right on a 42-yard field goal attempt. Neither team was able to come close to scoring for the remainder of the period, with the Cowboys unable to get out of their end of the field. The Bills blitzed heavily and went with an eight-man front, thus hampering the Dallas running game and forcing Roger Staubach to go to the air. Midway through the second quarter, and following a 13-yard punt return by rookie WR Butch Johnson, Dallas put together the game’s first scoring drive. HB Preston Pearson (pictured at left) had a catch for 25 yards and ran for a 14-yard gain around end. He finished off the 54-yard series with a two-yard touchdown carry and Efren Herrera added the extra point. The Bills were pinned deep in their own territory on their next series and punted but got a break when Johnson couldn’t handle the erratically-bouncing kick and LB Dan Jilek recovered at the Dallas 42. Three plays later, Marangi threw to TE Reuben Gant, who broke two tackles on the way to the end zone for a 27-yard TD. Jakowenko’s point after tied the score at 7-7. The Cowboys regained possession at their own 39 following the ensuing kickoff with just 26 seconds remaining in the first half. Staubach, who had completed only four of 12 passes thus far, fired to Drew Pearson for a 40-yard gain to the Buffalo 31. On the next play, Staubach threw to Pearson again, who had gotten behind SS Doug Jones and pulled the ball in for a 21-yard touchdown. Herrera added the PAT and Dallas took a 14-7 lead into halftime. Johnson returned the second half kickoff 74 yards to the Buffalo 14, but Staubach lost two yards when the ball slipped away as he was trying to pass and, while he recovered, a penalty backed Dallas back farther. Facing fourth-and-33, the Cowboys faked a field goal and Herrera punted. Later in the period, Dallas again advanced into Buffalo territory, but after the drive stalled at the 14, Herrera’s field goal attempt from 31 yards hooked to the left and missed. Still, Buffalo wasn’t able to gain any ground against the tough Dallas defense and the tally remained unchanged. Early in the fourth quarter, Herrera kicked a 43-yard field goal to make it a ten-point contest. With time running down, the Bills put together a drive that included Marangi passes of 12 and 13 yards to Chandler and to Gant for 24 yards to the Dallas five. They had to settle for a 22-yard Jakowenko field goal, however, with 1:57 remaining to play and the Cowboys held on to win by a final score of 17-10. Buffalo, which never had the lead, held the edge in total yards (250 to 228) and first downs (19 to 14), holding the Cowboys to just 63 rushing yards. Each team turned the ball over one time. Dallas recorded five sacks, to three by the Bills. Roger Staubach went to the air 34 times and completed only 15 for 202 yards and a touchdown while giving up no interceptions. Drew Pearson was the chief beneficiary, with 9 catches for 135 yards and the TD. Preston Pearson led the ground attack with 29 yards on seven attempts that included a TD and also had the 25-yard gain on his lone reception. Defensively, DE Harvey Martin accounted for three sacks (unofficially, since sacks were not officially compiled in the NFL until 1982). For the Bills, O.J.Simpson was held to 78 yards on 24 carries, with no run longer than nine yards. Gary Marangi completed 10 of 28 passes for 132 yards and a TD along with one interception. Bob Chandler caught five passes for 63 yards and Reuben Gant (pictured at right) added two receptions for 51 yards and a touchdown. “Our offensive performance wasn’t good at all,” summed up Roger Staubach. The win gave Dallas a 9-1 record, the franchise’s best start thus far. The Cowboys lost at Atlanta the following week, but won an important showdown with the Cardinals on Thanksgiving and cruised to an 11-3 tally to top the NFC East. They fell to the Rams in the Divisional playoff round. Buffalo kept losing the rest of the way and ended up at the bottom of the AFC East with a 2-12 mark that was the club’s worst in five years. Roger Staubach had his highest totals to date in pass attempts (369), completions (208), and yards (2715), all of which were eclipsed in the remaining three years of his career, and he was named to the Pro Bowl for the third time. 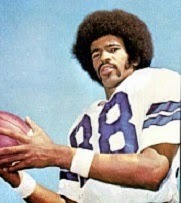 Drew Pearson had 58 catches for 806 yards (13.9 avg.) and six TDs and was a consensus first-team All-NFL as well as Pro Bowl selection.